trying out this process. starting today. using habs recipe have my brine cooling now. 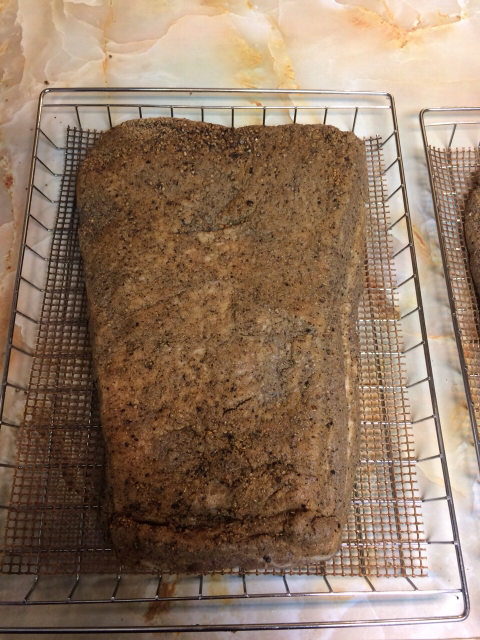 brisket trimmed down to just over 9 lbs. its from a farm where I get my beef and its long and thinner. to make it fit in my brine container I cut it in half. 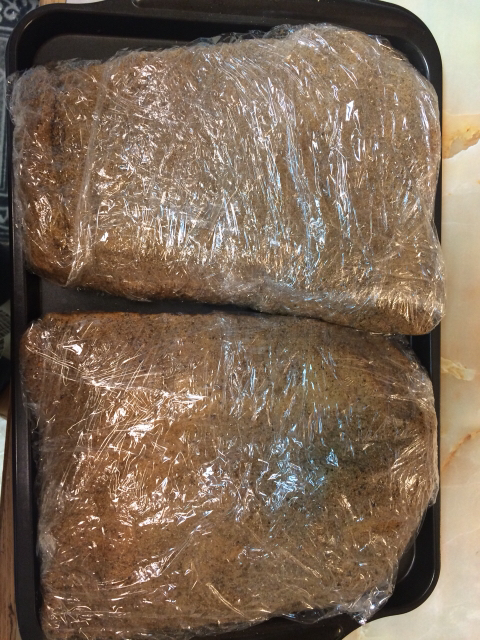 no pic today but when its done curing and before and after the smoker I will update.. any modifications to your process habs?? You are lucky to have a local source. 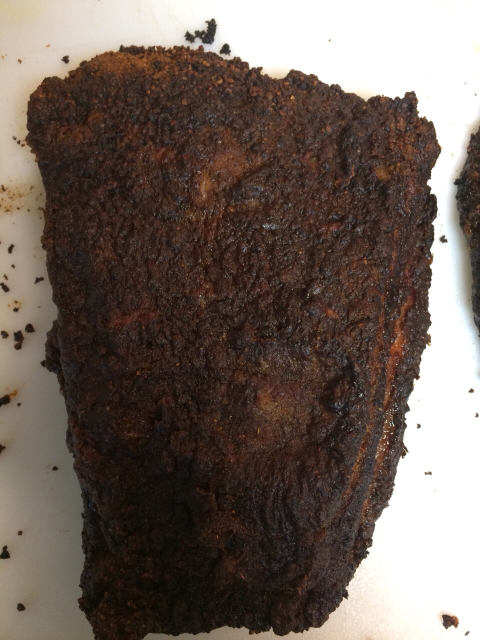 Brisket in my area is either difficult to find, or the price is often around $7.00/lb. I've made a few minor changes throughout the years. I'm not sure what version of my recipe you are going by, but any changes I've made have been minor; except the final internal temperature. If I'm not planning to steam it, I will bring the IT up to 185°F. If I plan to finish by steaming, I will smoke/roast it until the IT gets up to 160°F - 165°F, then finish it by steaming. For the short time that I "FTC", which is 2 hours, I just wrap in a layer of plastic wrap, then a layer of foil and place it in my microwave for the two hours; but with the amount you have I don't think it is possible. using the recipe from the susanminor site/wet cure with info from a couple links you added. smoked cured ham and kitchen calculator. That is very close to the recipe I use now. The only difference is that I now smoke/roast at 225°F - 230°F, and take the final internal temperature to 180°F. Also if I don't add the white peppercorns, I still keep the coriander seed to 3 tablespoons instead of increasing it to 4 tablespoons. I love the My Kitchen calculator. For thoughs that have never used it, I've inserted a link below. Make sure you review the video tuturial; it makes using the calculator much easier. Smoking day . Bradley preheating to 230 going to use cherry or apple. Will make up my mind when i put the meat in the box. Temp up to 185 out and foiled to rest 1 1-2 hrs. Nice colour and taste but seems a might salty. 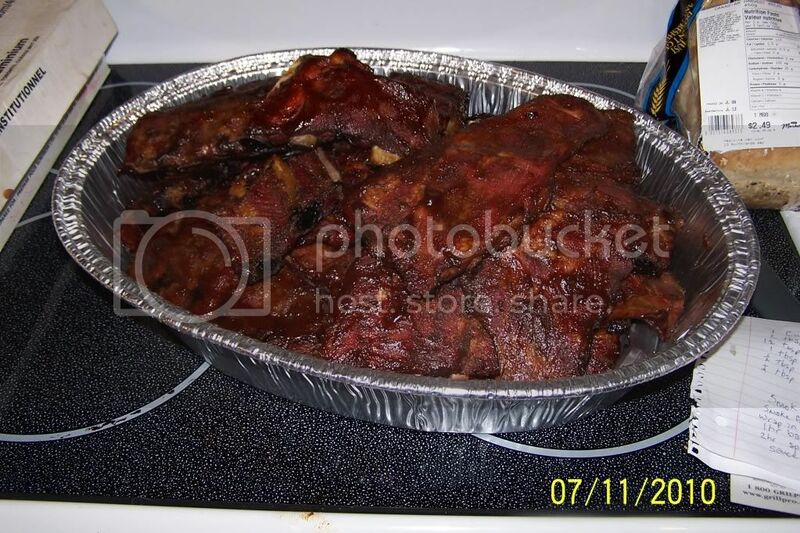 Before the rub soaked 1/2 hr change water soak 1/2 hr taste test soak change soak test rub and smoke. Will give it a day and check again. Sorry to hear it is overly salty. How long did you brine for? I would expect the salt taste to remain the same when you taste it again. If it is still salty, the salt may not be that strong when you make sandwiches with it, or use it in recipes. 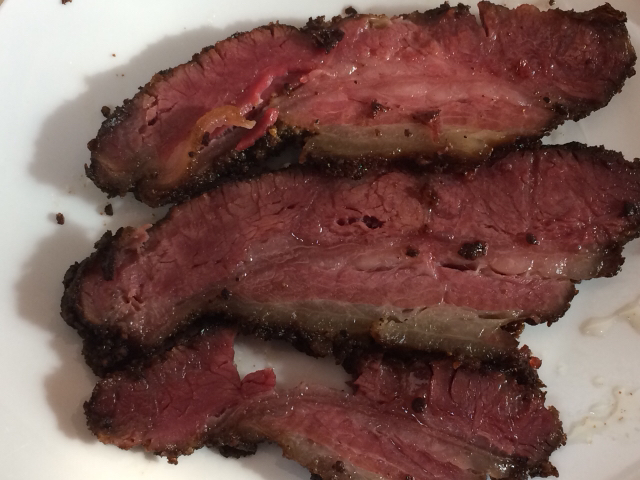 The below recipe is a great recipe to use your pastrami in. If you pastrami is overly salty, I would omit the salt the recipe calls for. If you use this recipe again, try reducing the salt to 8 ounces. in the brine for 6 days. most of the salt is in the crust. 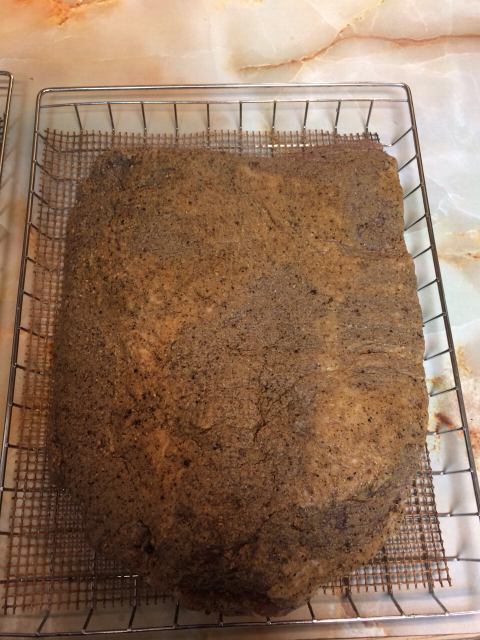 biting in the middle of the slice is good so I am hoping that when I thin slice and make a sandwich it will be ok. first time making pastrami and I can still use the meat. not wasted but I learn more every cook. 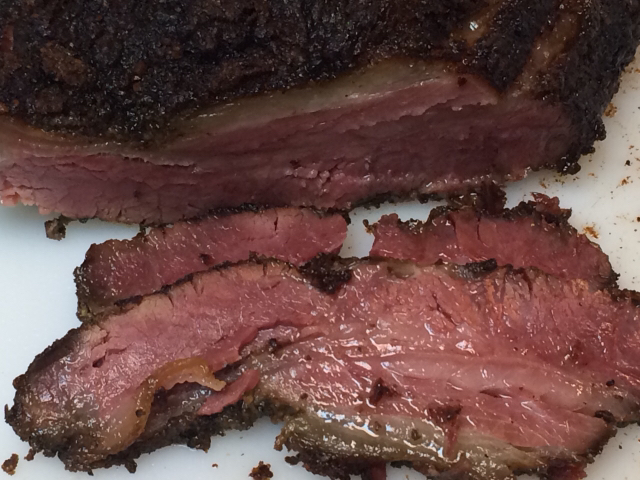 I forgot to mention that your pastrami looks great. It has me craving to make some. O.O what is that and how do I make it? I might have to try to make that next summer when I have time. I don't believe I ever posted the directions on this board. I posted it on a site that was referred to as the Recipe Site; which is no longer available. Below is a link to the achieved post. Some times the site is not stable, and links within the post may not work. If the link within the post doesn't work, sometimes clicking on the back arrow of your browser will refresh the page and display it properly. I suggest the following changes, if you are using the wet brine reduce the amount of salt to 7 ounces. Bring the internal temperature up to 185°F. Also if you don't have the white peppercorns for the rub, leave the coriander at 3 tablespoons. yup I agree with habs. 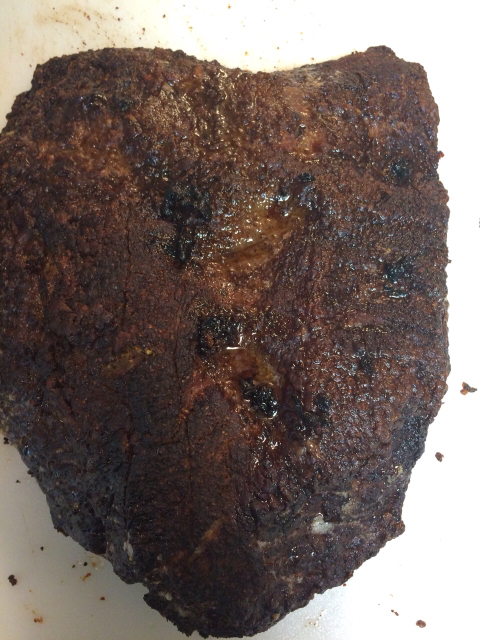 the salt content is tp high and I did a 9 lb brisket. I made ruben sandwiches last night and just to much salt. smoke and learn the rest of my pastrami will get chopped up and used in soups. all of my measurments were done by weight.